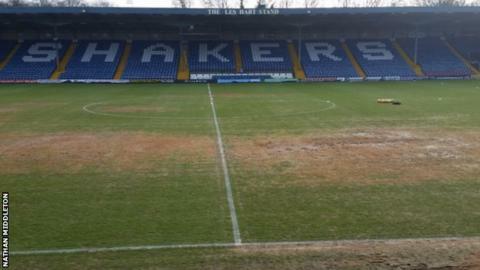 Bury boss David Flitcroft says the reason for the poor playing surface at the JD Stadium is that the pitch has "failed". The Shakers spent a reported £150,000 on relaying the surface last summer but it has badly cut up in recent weeks. The League Two side overcame the conditions to beat struggling Carlisle 2-1 at home on Saturday. "It's deteriorated, failed, collapsed - whatever you want to say, and results haven't been right," said Flitcroft. He told BBC Radio Manchester: "For two or three of those games, I'm as guilty as anyone to try and play the beautiful game on that. "We can't moan about it, it is what it is. We've got to play our home games here and the lads today were fantastic on it. Bury slipped out of the promotion race following some indifferent form over the past couple of months, but the three points secured on Saturday moved them back into the play-off positions. Flitcroft's side have won three of their last five games and he believes his team are becoming more consistent. "November was a real poor month and I can't get away from that," added Flitcroft, 41. "I tinkered too much with modifying the team and the squad, but now we're settled there is a real trust building and developing. "There is still a lot of games to play so I'm as excited as anyone."